The 2018 Rwanda Mission Team arrived safely in Kigali in various groups from Friday, September 21st through late Sunday, September 23rd. 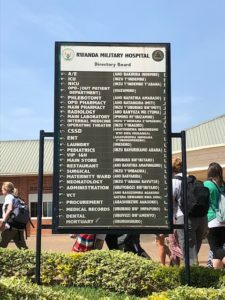 The majority of the team was able to visit the Rwanda Military Hospital on Sunday morning to get a look at the facilities and to screen patients. The Rwanda Military Hospital is laid out much like an academic campus with separate buildings for difference uses. 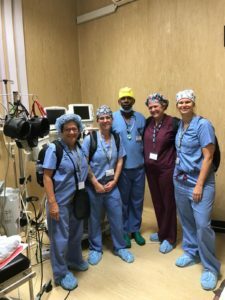 The main operating rooms are located in one building and the gynecology procedures are performed in a building across the campus. 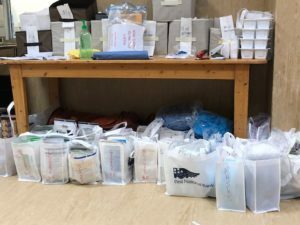 For some, Sunday morning, was spent unpacking and organizing the medical supply room and screening patients for surgeries. We are fortunate this year to have a large area to house our supplies in very close proximity to the Operating Rooms and Operation Medical veterans claim this is the most organized and efficient storage yet. Monday has 17 cases on the list and we just received notice of an emergency case for a four-year-old with intussusception, the most common abdominal emergency affecting children under two years old. It is a medical condition in which part of the intestine folds into the section next to it and typically involves the small bowel. Symptoms include abdominal pain which may come and go, vomiting, abdominal bloating, and bloody stool can often result in a small bowl obstruction. We are hopeful to be able to help this little fellow, but are waiting on lab results. Please check back tomorrow for more updates.